As the market leader in adjustable dumbbells it was simply a matter of time before PowerBlock released an adjustable kettlebell. Instantly recognisable as a PowerBlock product, the PowerBlock Kettle Block is sold in two different weight ranges: 2-20 pounds and 8-40 pounds. What I love about the PowerBlock Kettle Block is how quick and easy it is to adjust the weights. If you frequently change weight settings then you’ll appreciate an adjustable kettlebell that’s quick and easy to use. That’s exactly what the PowerBlock Kettlebell is. The first thing you notice when looking at the PowerBlock Kettle Block is the distinctive coloring of the weights. 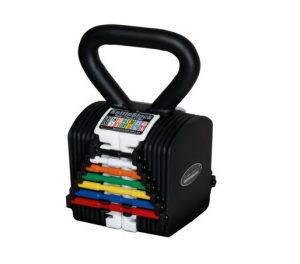 Each color represents a different weight are displayed beneath the handle on the weight selector chart. The 5-20 pound Kettle Block replaces up to 5 kettlebells and allows you to adjust to the following increments: 5, 8, 12, 16 and 20 pounds. Whereas the 8-40 pound replaces up to 8 kettlebells. You can adjust the weights in the following increments: 8, 12, 16, 20, 25, 30, 35 and 40 pounds. Note: The 8-40 pound Kettle Block also comes with an expansion unit meaning you can increase the weight range to a whopping 55 pounds. As for adjusting the weights, that’s the best part of the Powerblock Kettle Block. Thanks to the selector pin there’s no more fiddling about or wasting time removing the outer casing. You simply refer to the color coded weight chart, then using the selector pin you slide it in to match the desired weight setting. It’s that simple. As for the handle. 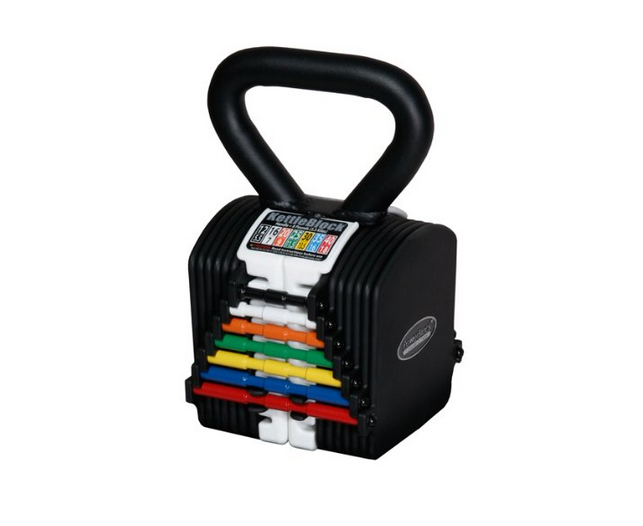 It weighs 8 pounds on it’s own and can be used to workout without any weights. It’s large enough to accommodate two handed workouts. What I liked was the fact the handle wasn’t too big with lots of free space when working out with two hands. Compared to other adjustable kettlebells i’ve reviewed, the handle seemed a bit thicker which suggests the Powerblock Kettle Block is built for men? Sorry I hate to sound sexist, but I think those with smaller hands may find it’s too big. In terms of smoothness the Kettle Block I used was completely bobble free. As you’ll see from the pictures the shape is non traditional. This is where the Powerblock Kettle Block falls short. Traditional kettlebell are rounded which makes them much smoother and less clunky to operate. Also at 13 x 11 x 10 inches in size the Powerblock Kettle Block is is quite big. What I do like about the shape is that the Kettle Block has a flat bottom. When your completing a floor based kettlebell workout it’s essential that you have good balance. The final thing to mention is the material. The handle is made from metal and is coated black. The body and weights are also made from metal and partially covered in plastic. The plastic coating keeps them looking new by offering protection from chips etc. Shape/Size: Because of the clunky square design it’s easy to bruise your forearms by catching yourself against the weight whilst in motion. Overall I was extremely happy with my PowerBlock Kettle Block. Whilst it did take some me some time to adjust to the shape and size, I loved the easy of use. As a person who adjusts the kettlebell weights multiple times in a single workout, it’s essential I can do this with maximum efficiency. The selector pin makes this really easy and was a real plus for me. I was also impressed with the build quality. This is reflected throughout the Powerblock Kettle Block. What I mean by this is the handle is comfortable and bobble free, theres no rattling whilst in motion and it feels like a premium product. You also get a free lifetime warranty which is not usually offered with an adjustable kettlebell. Finally, the Powerblock Kettle Block is pretty nice to look at. It makes my home gym look and feel that little bit more professional. As mentioned throughout this review, the shape and size can cause issues. I even contacted other customers to see if anyone else had experience this. Like myself, others commented that they sustained some bruising after catching their forearms on the edge of the Kettle Block. Whilst this can happen, you can easily avoid it by wearing wrist protectors or adjusting your technique slightly. In terms of ease of use and build quality the Powerblock Kettle Block is the best adjustable out there.